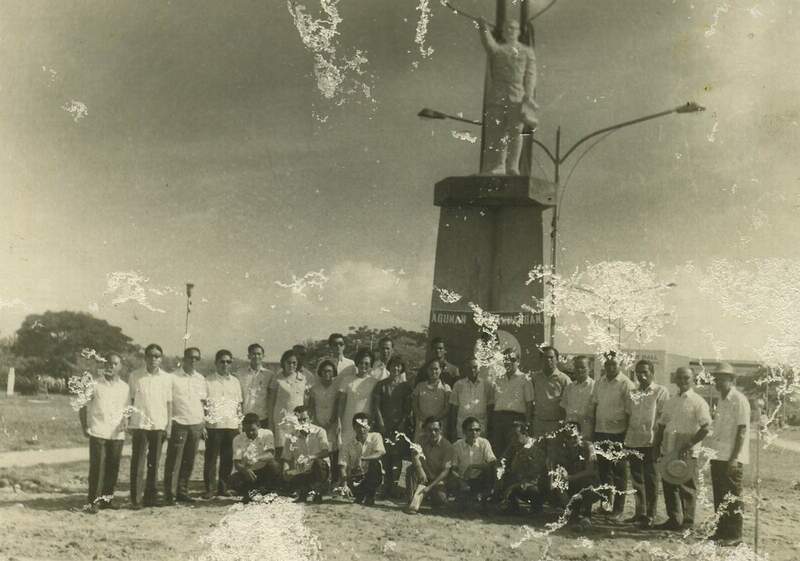 What struck me here is the statue behind them of General Paulino Santos, Sr., which the group must have donated to the local government earlier before this photo was taken, since their banner was hung at the base. At the background farther back is the old wooden building of the local municipal government of Buayan, years before its view was obstructed by a bigger concrete edifice for the newly-proclaimed City of General Santos constructed right in front of it. Above is a very recent photo of what is now the statue of Gen. Paulino Santos, Sr. taken during the wreath-laying ceremony in honor of the city’s founder timed at the opening program of the 69th Foundation Day of the Tuna Capital last February 27, 2008. The building behind it is the newer City Hall, now covering the view of the 59-year old rickety wooden structure seen at the background of the first photo above. Try comparing the two photos and notice how barren the plaza fronting the city hall was ages ago. Now, it’s dotted with trees and other ornamental plants and serves as a rest and recreation area for tired and weary “generals” (as people in GenSan call themselves). Below is the marker detailing a short biography of the general (in Tagalog) posted at the foot of the monument. Categories: Landmarks, Monuments & Shrines Tags: 69th Foundation Day of Gen. Santos, Aguman Kapampangan, Avelino Manansala, Buayan, Dadiangas, Gen. Paulino Santos, Sr.
You may also visit the General Santos Museum at Marist Ave. inside NDDU. @GensanBoy: Tama ka dyan. Pero kailangan din dapat palitan na ang ating lumang city hall. Masyado nang dilapidated at nagmumukhang unano sa mga nagtataasang punong kahoy sa tapat nito. dapat ang city hall ay mas mataas pa sa mga punong kahoy na yan. Dapat kasama lagi sa pinupuntahan ng mga bumibisita sa lungsod ang estatwang ito. Yes its right. Gen. PAulino Santos died in the jungles of Mountain Province in Luzon because of Malaria. His remains were then transferred to the city that was named after him in the early 90s. Hi Solomon, I hope you can check the cause of death of Gen, Santos. I believe he was not beheaded by the retreating Japs. He died while in captivity by the retreating Japs due to extreme fatigue, hunger and malaria in the jungles of Mountain Province in luzon and not in Dadiangas. I believe It was the national hero Jose Abad Santos who was executed by beheading during the war by the Japs. And the sad part is that he was beheaded by retreating Japanese soldiers in 1945 here in Dadiangas and his head was still could not be found. I know that pen is mightier than sword and this is a disturbing news for me of what I have read about Gen. Paulino Santos.